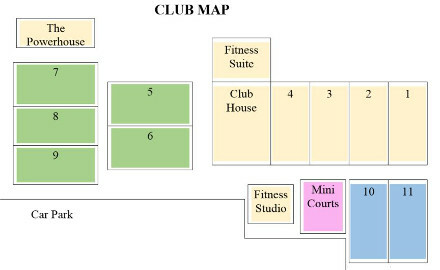 ** The Club closes at 1900 on Saturdays but outdoor courts 5 – 9 can be booked beforehand (online or through reception) and are accessible via the side gate for members’ use only. The code for the gate can be retrieved from reception. Floodlights for these courts will turn on and off automatically but there will be no access into or through the Clubhouse. Please secure the gate behind you if you use this entrance, thank you. Please click here to be transferred to our online booking system. All courts need to be paid for at time of booking. 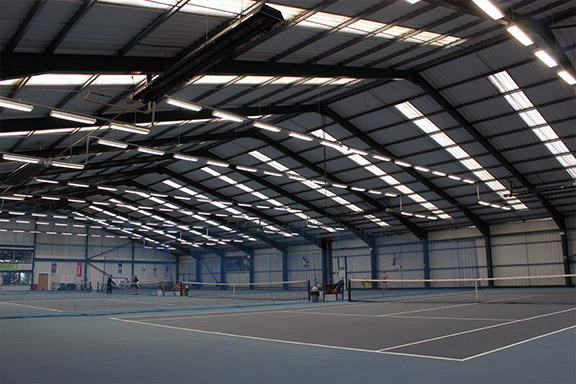 Non-members wishing to use our indoor courts, will pay the above court fee plus VAT (20%) in addition to £5 per person visitors fee. Non-members wishing to use the outdoor courts will pay £6 per hour in addition to £5 per person visitors fee. Floodlight charges may also apply. Non-members may visit 5 times in a 12 month period without becoming a member. We now offer pay and play from April to September @ £8 per court, Weekdays between 1pm and 3pm and Saturdays between 4.30pm and 7pm outdoors on court 10. A £5 deposit is required for the key. During the winter months Saturday pay and play can be booked between 9:00am and 4.00pm, subject to availability.